If you have fibromyalgia, you've probably wondered if there are ways you could modify your diet to improve symptoms such as fatigue and muscle pain. Research hasn't shown that there are specific foods that all fibromyalgia patients should avoid or add to their diets. But it may still be worthwhile to take a closer look at how foods impact the way you feel. "There aren't many good studies that have looked at how diet can affect fibromyalgia symptoms. But I think we can gather a lot from anecdotal evidence -- from what patients tell us," says Ginevra Liptan, MD, medical director of the Frida Center for Fibromyalgia in Portland, Ore., and author of Figuring Out Fibromyalgia: Current Science and the Most Effective Treatments. Here are some of the ways doctors say food can play a role in fibromyalgia and tips on how you can tweak your diet to support your overall health. Many people with fibromyalgia have learnt to manage their condition so that they can continue to live their lives enjoyably despite their symptoms. The following sections look at some of the things that might help. If you have fibromyalgia your muscles will often feel stiff and tense, making them more prone to sprains and strains. It’s important to reduce this tension by stretching your muscles regularly. Aerobic exercise improves fitness and reduces pain and fatigue in people with fibromyalgia. It should also improve your sleep and general well-being. Aerobic simply means increasing the circulation of oxygen through your blood, so any exercise that gets you breathing heavily and your heart beating faster is aerobic. Swimming is particularly recommended for people with fibromyalgia, but walking or cycling are also helpful. Build up your exercise at a rate you can cope with, pace yourself and be patient. You may find that your pain and tiredness become worse at first as you start to exercise muscles that haven’t been used for a while. Try to do the same amount of exercise each day so that you build up your muscle strength and stamina levels. Increasing your exercise little by little will also improve your fitness and flexibility. Yoga has been shown to help some people with fibromyalgia. Read more about exercise and arthritis. No particular diet has been proven to help fibromyalgia, but we recommend keeping to a healthy weight by eating a balanced diet with plenty of fruit and vegetables. Treatments like massage, acupuncture and manipulation by a chiropractor or osteopath may temporarily ease your pain and discomfort. Some trials have shown that capsaicin gel (only available on prescription) and homeopathy may be helpful. However, the evidence isn’t strong enough for these treatments to be recommended. Read more about complementary and alternative medicine for arthritis. Cognitive behavioural therapy (CBT) may be helpful for some people who have severely disrupted sleep. Read more about fatigue and arthritis and sleep and arthritis. Learn about fibromyalgia. Understanding it can help to ease your fear and anxiety. Find out if there’s a support group in your area, or think about joining an online fibromyalgia forum or expert patient programme. Discussing your experiences with others who have fibromyalgia may help. Encourage your family and friends to find out more and discuss your condition with you. It’s especially important that they understand you may be in severe pain even if you look well. Learn to take time out for yourself to relax your mind and your muscles. Pace yourself. It’s tempting to do a lot on one day, but doing too much can make your symptoms worse the next day. Spread things out over a longer period and make sure you do things you enjoy as well as things you have to do. Try the medication your doctor has to offer and discuss which ones are helpful. Find effective ways of communicating feelings such as anxiety or anger. Counselling or cognitive behavioural therapy (CBT) can help to break the cycle of anxiety, depression and pain and has helped many people keep their pain under control – your GP will be able to refer you. Unhappiness at home or work can make pain feel worse. Addressing the causes of this unhappiness could help. Ask for help from people at your work, such as a friend, colleague or manager. You can also seek advice from experts such as occupational therapists, a Jobcentre Plus office and the Citizens Advice Bureau. They can work with you and your employer to find the best solution for everyone. What treatments are there for fibromyalgia? There’s no cure as yet for fibromyalgia, but there are ways of managing your symptoms. Your doctor will be able to suggest treatments to tackle specific aspects of the condition. Your doctor can prescribe medication to help with your symptoms. Painkillers like paracetamol can help to relieve pain. Drugs such as low-dose amitriptyline and dosulepin can reduce muscle pain and improve your sleep pattern. These drugs need to be taken 2–3 hours before you settle at night. You may not feel the benefit straight away so try them for a few months to see whether they help. Your doctor will gradually increase the dose to an effective level. Antidepressants, such as fluoxetine or paroxetine, can help with both pain and low mood. Drugs such as pregabalin and gabapentin have been used to treat pain. You’ll need to take them for a period of 6 weeks to assess whether they’re helpful. Duloxetine can help with pain and sleep disturbance. Your doctor may refer you to a physiotherapist or occupational therapist for further treatment and advice. Physiotherapy can help you to improve your posture, stretch and relax your muscles, and gradually become more active. Physiotherapists can also advise you about relaxation techniques. Occupational therapy can help you to manage your everyday jobs without increasing your pain or wearing yourself out. Your occupational therapist may suggest pacing yourself, changing the way you work or using labour-saving gadgets. What conditions may be related to fibromyalgia? The symptoms of fibromyalgia are often very similar to the symptoms of myalgic encephalomyelitis (ME), or chronic fatigue syndrome. We need to know more about the conditions before we can say whether they’re the same thing. We don’t yet know exactly what causes fibromyalgia, but research suggests that there’s an interaction between physical, mental and psychological factors. The pain we feel is often affected by our emotions and moods – depression or anxiety can make the pain seem worse. At the same time, being in pain can lead to stress and anxiety. Many people with fibromyalgia report that their symptoms started after a viral infection, a physical or mental trauma (like a car accident or bereavement) or following a period of stress and anxiety, for example in a relationship. The pain doesn’t have a physical cause but is something to do with the way your brain processes pain. This doesn’t mean that the feeling of pain is any less real, but because there’s no physical reason, fibromyalgia doesn’t cause any permanent damage to your joints. People with fibromyalgia are more sensitive to physical pressure. This means that what would be a relatively minor knock for most people could be extremely painful for someone with fibromyalgia. It’s thought that this increased sensitivity could be related to chemical changes in the pain pathways in your body. depression brought on by illness or unhappy events. In an experiment where healthy volunteers were woken during each period of deep sleep, a number of them developed the typical signs and symptoms of fibromyalgia. Not surprisingly, a combination of pain, sleep disturbance and anxiety or depression can turn into a vicious cycle. A poor sleep pattern will contribute to the severe tiredness that often goes with fibromyalgia. Fibromyalgia is often difficult to diagnose as the symptoms vary considerably and could have other causes. They can be similar to the symptoms of other conditions, for example an underactive thyroid gland (hypothyroidism). Your doctor may suggest you have blood tests to rule out other conditions. A diagnosis of fibromyalgia is made if you have specific tender points in certain areas of your body. These areas can be tender even when they’re pressed very gently. While tenderness can occur at individual sites in other conditions, for example tennis elbow, if you have fibromyalgia you’ll have tenderness in many different parts of your body – usually 11 or more. 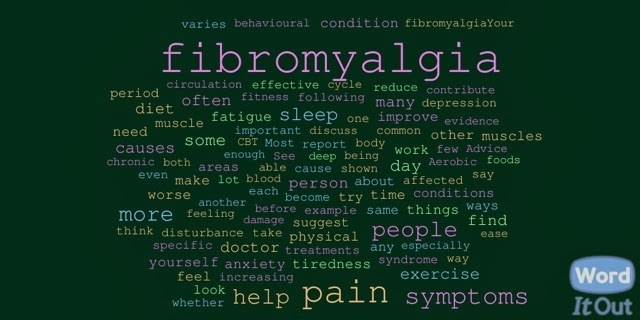 Fibromyalgia.co.uk. Ethereal theme. Powered by Blogger.